It's your final reminder to play along with our ANYTHING BUT A CARD challenge this month which closes next Monday night at 10pm. I made some Word's of Encouragment wall hangings using Wplus9's 'Dreams into Plans', and Mama Elephant's 'Index Card Creative Cuts'. 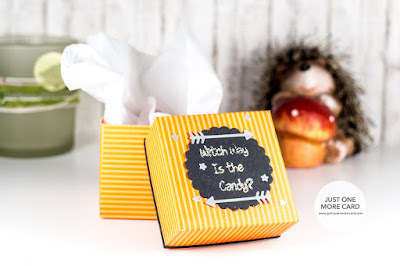 I created a small treat box and embellished the top with Lawn Fawn's Scalloped Circle dies, the arrows from the Mama Elephant Basic Set, and a sentiment from MFT Witch Way Is The Candy.